The soap and bubbles solution was probably the only effective way for technicians to find leaks in any system for many decades. Even today the method of soap and bubbles is used to detect oxygen, nitrogen and air leaks etc. However, when it comes to a dangerous gas like Halogen this type of detection method fails simply because it is too dangerous. In addition the soap and bubbles technique is not as accurate when it is applied to a broader and larger system with hundreds of different pipes and this is where using a halogen leak detector comes in. Halogen leaks can be dangerous, they are known to cause explosions and fires, and so touching an area which is leaking is not a good idea. Halogen gas leaks in larger systems are very hard to detect without using a specialized detector. Halogen gas leaks if not found and repaired quickly can cause widespread damage which is why using a leak detector is so important. The electronic detector was invented back in 1963 and used a method called Corona Discharge Detection Method. However the concept has evolved and improved over the years thanks to extensive research into gases and the effects they have on metal electrodes and other materials. In addition the introduction of what is now known as micro-pump technology has helped to enhance the accuracy of an electronic halogen leak detector. 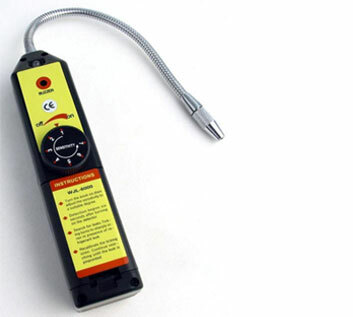 Today there are two types of electronic detectors i.e. ones that use traditional detection methods and ones than use sensors. Sensors are a comparatively latest introduction into the world of halogen leak detection but they have proven to be very accurate, in addition they have enabled technology to further shrink the size of a detector and make it so that everyone and anyone can carry around a detector in their car. However, it is important to understand that small detectors may not work very well for large factories or installations with hundreds of pipes via which the gas is flowing, here you will mostly need a bigger detector ideally attached to the system. For an individual purchasing a halogen leak detector will first need to determine what he is going to use it for. However, for most domestic and purposes a small handheld detector costing around $500 works best. These detectors can be used to find leaks in air-conditioning units, refrigeration units etc. however, for large installations a much larger detector will be needed, these detectors will need to be fitted into a halogen transfer system which allows for it to constantly monitor it for changes in pressure as well as detect any leaks which may occur. These kinds of detectors can cost thousands of dollars and they will need to be professionally installed.